The full name of our company is Powerful Vision Ltd. This document was created using extracts of an SEQ Legal template. By placing an order with Powerful Vision Ltd, you agree to the following Terms and Conditions of Sale in full. If you disagree with these or any part of the Terms and Conditions of Sale, then do not place an order without contacting us first. Powerful Vision Ltd shall not be liable to the Customer for any consequential loss or damage (whether for loss of profit, goodwill, business revenue or otherwise) costs, expenses or any other claims for consequential compensation whatsoever which arise out of or in connection with the supply of the Goods or their resale by the Customer. These Conditions shall apply to any agreement between the Company and the Customer for the sale of the Goods. All other terms and conditions and warranties whether express or implied statutory or otherwise are excluded. Powerful Vision Ltd shall not be liable to the Customer or be deemed to be in breach of contract by reason of any delay in performing or any failure to perform any of the Company's obligations in relation to the Goods, if the delay or failure was due to any cause beyond the Company's reasonable control. By placing an order with Powerful Vision Ltd, you are confirming that the details you have submitted are correct and accurate and that you are the authorised user of the debit or credit card used to place to order. If payment has been made through a PayPal account you are confirming that you are the authorised user of that account. Once an order has been placed you be sent an emailed order acknowledgement confirming that you order has been received. A subsequent e-mail will be sent confirming the dispatch of the goods. A contract is only formed once the dispatch confirmation email has been sent. For multiple goods, only the items listed on the dispatch confirmation e-mail will form the contract. If we discover an error in the price, description or availability of any goods you have ordered, we will inform you without delay. You will be given the option of re-confirming your order taking into account the error or cancelling your order. You will be refunded in full for a cancelled order. We accept payment via PayPal or from MasterCard, Visa, Visa Electron, Maestro, Switch, Delta and Solo. All prices are inclusive of VAT. Payment of incurred import duties are the responsibility of the customer. The sales transaction will appear as Powerful Vision Ltd on your statement. If you disagree with the amount debited contact Powerful Vision Ltd within ten working days of the transaction date. 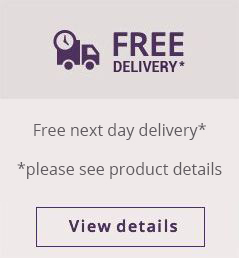 We provide FREE next working day insured delivery (except Saturday PAID delivery and Sunday PAID delivery available on 24hr items only) to anywhere in the UK with tracking confirmation sent directly to you via email when the order leaves our warehouse (unless stated on the product). 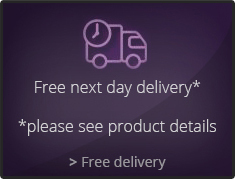 Next day delivery is only valid if orders are placed before 15.00 Monday –Thursday; If ordered on Friday before 15.00 your order will reach you on Monday; If ordered after 15.00 on Friday or on the weekend your order will arrive the following Tuesday. 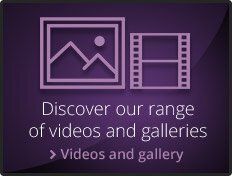 Some larger products are on a 48hr delivery. The items that use this service will have 48hr delivery clearly stated next to the website listing of the product. We offer Saturday nominated delivery for an extra charge. The Customer cannot avail a Saturday delivery when ordering a 48HR Delivery item on any Friday. Orders placed over the weekend or on a Bank Holiday will be processed the next working day. Failed deliveries will be reattempted the following work day. After the third attempt the product will be stored for collection at your local Post Office. Powerful Vision Ltd shall be under no liability whatsoever for any loss, damage or incurred costs arising from any delay in despatch or delivery. If an incorrect delivery address was specified at the time or ordering, Powerful Vision Ltd will not be liable if the item fails to reach the correct address. No refunds will be given. Items should be checked immediately upon receipt irrespective of your planned installation date. Broken or defective parts or products must be reported to us within 48 hours of you receiving the product. If you inform us of the breakages after this time we cannot warrant your claim. We will arrange for a replacement product or specific part to be sent as soon as possible once the damage or defect has been reported. We will require a clear photograph of the damage or defect prior to dispatch. 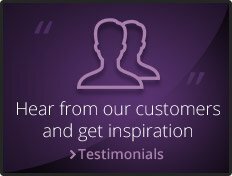 If you are not entirely satisfied with your product for any reason, please contact us within 14 days, beginning on the day after you receive the goods. To return products you must inform us in writing or in another durable medium. You will then be informed of the return procedure by e-mail. Check the product suits your requirements before you install it as once your mirror or cabinet is installed and fitted to the wall we cannot give you a full refund. Returned products must be complete, unused and in 'as new' condition. It should be returned with the original box, packing and accessories and within five working days once you have cancelled the contract. The product's proof of purchase should be attached to the packaging. You are advised to retain proof of posting. The customer is wholly responsible for the costs associated with returning a product. Once we have received the item back in its original condition a refund will be credited back to the original payment card. The refund will not include any incurred postage costs. If you are in possession of the goods you are under the duty to retain them and take reasonable care of them. Until the item is received back at our warehouse it remains your responsibility. Powerful Vision Ltd will not be liable for any damage or loss of your item during the return transit. We reserve the right to refuse an exchange or refund if goods are not returned in a saleable condition or are damaged. We reserve the right to make a charge not exceeding our direct costs of recovering the goods if you do not return them at our expense. 21.1 We will not accept an exchange. 21.2 We will only accept returns for repair. 21.3 We will only refund for breakages or manufacturing defects. 21.4 An order cannot be cancelled if the production process is underway. 21.5 Any bespoke items (including those with additional add-ons), returned either for an exchange or full refund will encounter a £30 non-negotiable re-stocking fee. This is separate from the £25 collection fee which applies to circumstances where we collect the item(s). 22. When will I get my refund? Usually within 2-3 weeks of returning your order. After we receive and process your return, it may take 5-7 business days for your refund to display on your payment card statement. Warranty apply from the date of invoice, sale invoice should be retained as this is your proof of purchase and warranty commencement date. Hollywood Mirror products will carry lifetime parts only warranty. LED Mirrors and Cabinets will carry ten year parts only warranty. Factory seconds products will carry one year parts only warranty. The above warranty is given for the benefit of the original purchasing Customer only and is not transferable or assignable by the Customer to any third party. 23.1 any defect arising from fair wear and tear, wilful damage; negligence; failure to follow the Company's instructions (whether oral or in writing); alteration or modification of the goods; premature failure caused by poor cleaning and/or maintenance; damage caused during return transit to the Company; incorrect repair of the Goods. 23.2 of electrical or electronic components: damage caused by exposure to high voltages; static damage; damage caused by mishandling components; repairs made by an unqualified person. 23.5 surface corrosion is covered for 2 years from the date of invoice on mild steel products, and perforation warranty for 5 years from date of invoice. 23.6 Fluorescent tubes, Incandescent Bulbs and batteries are not covered under warranty. Hollywood range LED bulbs are covered for one year from the date of delivery of your Mirror. 23.7 any direct or indirect consequential liability, (whether for loss of profit, goodwill, business revenue or otherwise) loss, injury or damage (other than death or personal injury) arising through any such failure or defect. If the Customer has a warrantable problem with the Goods they should contact Powerful Vision Ltd.
We will endeavour to identify which component(s) need replacing and if available in stock we will send replacement(s) free of charge on a next working day delivery. We recommend that a fully qualified electrician fits all electrical or electronic parts however, any incurred costs will be at the Customers expense. The installation of the product and the fitting of any replacement parts by a non-qualified person are totally at the Customer's discretion and Powerful Vision Ltd is not liable for person injuries caused as a result. If we are unable to determine the fault of the Customer's item after three attempts we will arrange for the item to be collected for inspection by our technical team. At Powerful Vision Ltd.'s discretion we may offer the Customer a replacement product at this time, or alternatively it will be fully repaired and fully tested and returned to the Customer. Powerful Vision Ltd is not liable for any costs incurred in removing a faulty item or reinstalling a repaired or replaced item.